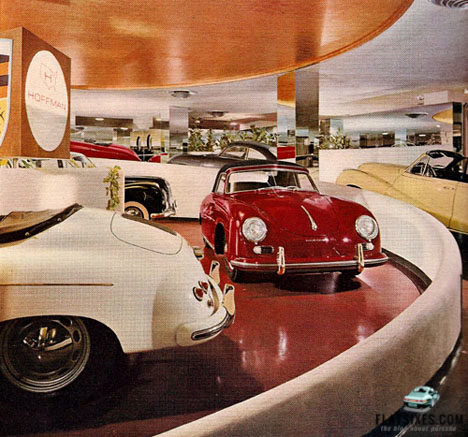 Did You Know Frank Lloyd Wright Designed One of Porsche’s First Showrooms in the US? UPDATE: 3-10-2013 We received this photo earlier in the week from one of our readers. Unfortunately, the showroom in this story was sold and gutted. It's being turned into a bank. What a waste. As Porsche enthusiasts, the majority of us likely know the story of Max Hoffman. Often heralded as the originator of imported European sports cars for the American buying public, Hoffman brought greatness to our shores in the form of Alfa, BMW, Jaguar, Mercedes, Volkswagen, and, of course, Porsche. Having emigrated from Europe in the 1930s, Hoffman started a costume jewelry business that afforded him enough income to move into the automobile sales market in 1947. Selecting his home of New York City as the starting place for his new dealership, Hoffman pulled out all of the stops and broke ground on a spectacular new location. Opened in June of 1947, the new dealer housed a single Delahaye 4-seat coupe model. Road and Track proclaimed the new dealer to be “Europe on Park Avenue”, and wwent on to say that “With the opening in New York City of The Hoffman Motor Car Company’s new showroom… New Yorker’s (sic) now have the opportunity to see for themselves examples of some of the world’s finest and most luxurious automobiles.” By 1949, the inventory would grow to include Jaguar, Rolls-Royce, Bentley, Austin, Cooper, Rover, Lea Francis, and Morgan cars. In 1950, Hoffman visited Porsche in Germany, and was pleasantly surprised by what he saw there. So much so that 15 brand new imported Porsche models made the return trip with him, which he quickly sold. From that moment, Hoffman became enamored with the Porsche brand, buying and selling as many as he could. Having previously been a successful racing driver in Europe, Hoffman began racing again in Porsche powered cars, gaining notoriety for the brand in the states with his exploits. In a meeting with Porsche in New York, Hoffman even proffered the idea that the brand was deserving of a representative emblem, and as such, the Porsche crest was born. Being New York City, and noting that even in the 1950s, it was a hustle-bustle kind of city, Hoffman knew that he would need something to set his second dealership apart from the rest. Not only would he need to provide the highest of quality European sports automobiles, but he would need to make the dealership itself a destination with the prestige and panache required to cater to New York’s elite. As this was the case, Hoffman contracted, arguably, the world’s greatest architectural designer and commissioned his expertise to create a beautiful environment, one complementary to the gorgeous lines of its inhabitants. Conversations with renowned Father of design, Frank Lloyd Wright, led to a few sketches, which Hoffman found agreeable. In 1955, Wright and Hoffman worked together to create a new display space for his Jaguar franchise only three blocks from his first dealership. The display space was confining, and could not fit many vehicles, but Wright made best use of it with a rotating plinth capable of holding four cars and a central planter box. Focal on the sales floor was an ascending, Guggenheim-esque, semicircle ramp leading up to the edge of the plinth. Wright had been experimenting with this style of ramp in his designs for several years, and a year after completing the Hoffman dealership, the Guggenheim would use this as its central focus of design. Other design elements of the building were also drawn up by Wright. Everything from the modern recessed lighting, to the new age built in furniture of the waiting room, and on to the planter boxes and cantilever observation balcony was a Wright design. The centralized planter box was originally designed with a leaping Jaguar sculpture in the middle, though it did not stay for long, and was replaced by a large box featuring the Hoffman dealer network logos. For his work, Wright was paid partially in automotive currency, accepting two new Mercedes from Hoffman as well as a large quantity of cash. Presumably, Wright was not interested in receiving payment in the form of a Jaguar. As it would happen, by the time the new dealership had been completed, however, Hoffman would abandon its use as a Jaguar house, and instead re-purpose the new facility for his Porsche and Mercedes sales. At this point, Hoffman had been responsible for the majority of Porsche importation to North America, and his distribution network was responsible for as much as 21% of Porsche's global sales. For the next three years, Hoffman moved a mass of Porsche and Mercedes cars through this dealer location. Eventually, the decision was made that he needed to relocate to a larger facility. As luck would have it, Mercedes-Benz was interested in taking over the Park Avenue space as their factory owned dealership, and the handover occurred in 1957. The facility has remained in the care of Mercedes-Benz since that time, and has been expanded tremendously over the years. An 80’s redesign brought flamboyance and mirrors to the original layout, though much of Wright’s original intention was maintained. A second renovation in 2002 brought a more Mercedes corporate look to the building with glazed glass and chromed accents, as well as much of the aforementioned expansion. 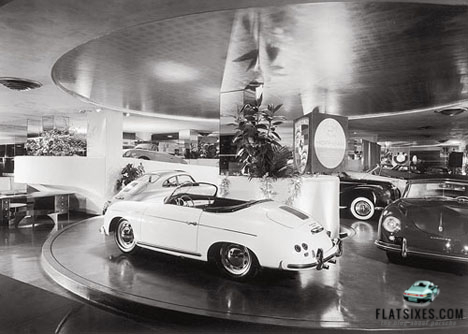 The central focal points of the dealership display floor have remained, though the planter on the rotating plinth has been enlarged, and the mechanism used to rotate the plinth no longer rotates as it gave up the ghost many years ago. In 2008, Mercedes invested 30 million dollars in the development of a new and larger flagship Manhattan based dealership. The aim was to improve customer care and efficiency. Since the new facility was finished in 2011, the two Manhattan facilities have been operating concurrently. Lately, Mercedes has shown a desire to move the property on to new owners and vacate the premises, focusing entirely on their new 11th Avenue address. Whether the new owners are automotive in interest or something else entirely, we can only hope that the space maintains its F.L. Wright inspiration and features. Want to Buy A Castle? Porsche has one For Sale! It was torn down last month. Those idiots. Wright also designed Hoffman’s residence in conjunction with the dealership. Both are historic structures and deserve preservation status. So much of New York is torn down in the name of progress; I hope that they preserve this showroom in some way, especially the signature ramps! The concept drawings are a nice inclusion to this piece. Where did you get them from? My Dad in 1965 designed the Midwest Porsche Headquarters located in Northbrook, Il. His payment was to either be cash or a new Porsche 912. I of course wanted him to take the Porsche because I would soon be getting my Drivers License and hoped to get behind the wheel. My mother, when she first saw a 912 proclaimed, “My, what a cute car!” That was all it took. Dad sealed the deal and got his first real sports car. Many years later while working in New York city I visited the (then) Mercedes Benz showroom because it was well known as having been designed by Frank Lloyd Wright. Thank you for including the photos and his drawings (although I do wish that you made your “Flat Sixes” logo not take up so much space. It in effect ruins the look of the photos and drawings). If you want the shots for your own personal use we’re happy to send them to you. Just let us know. Unfortunately, if we don’t watermark, conspicuously, people just take the pictures and re-post with no attribution. Even worse, some take them and sell them for personal gain. I’m standing outside of the old Hoffman Motors showroom as I type this (April 5 2013) and the last pieces of it are being shoved into a garbage truck. Completely gutted, not a trace remains… “Coming Soon: TD Bank” horrible. I sent a pic, let me know if it went through – if it didn’t work I’ll re-send it when I get home from work. Thanks, Sean. We got it and posted to our Facebook page. Thanks again for sending. Really sad that a piece of history like that just gets gutted. As an early teen-ager allowed for the first time to journey from the suburbs to Manhattan, and a devoted car-freak and sales-literature collector, I well remember the Hoffman dealerships, or at least this one and the earlier one on the southeast corner of Park Avenue and 59th Street in Manhattan. First, about two years earlier (late ’52, at a guess), Mercedes opened a very fancy showroom about three blocks south on Park Ave. from Hoffman, and I thought M-B and Hoffman had already parted company, commercially. Second, all the cars in your two (wonderful!) period photos that are not Porsches, are BMWs, not Mercedes. May we postulate that it was not Mercedes but BMW that in fact replaced Jaguar as Porsche’s companion in the new spiral showroom? Interesting that the article makes no mention of BMWs, two of which are clearly seen in the original photos. I believe they are Type 501s, one a cabriolet and the other a sedan. Those two cars are not Mercedes-Benz “pontons”. This is a real tragedy! F L Wright is/was one of the USA’s greatest architects and NONE of his works that remain should be destroyed. Was there no heritage study done, and are the local city rules/regulations on older buildings so slack that a treasure of this nature can just be destroyed? I am dumbfounded. Have we not done enough to destroy our architectural heritage, all over the word during the sixties in the name of “progress” to allow this kind of thing? Very few people would do this kind of hotrod treatment on a Porsche or Mercedes of the forties or fifties…..
That’s pretty much what we heard, too. Don’t know if it’s true or not, but would make sense.